Approaching from Vienna direction, follow the A4 highway – direction Budapest/Bratislava. Bear right and turn onto the A6 towards Bratislava/Kittsee. Follow the A6/E58. Exit towards E58/E65/E75. Take the exit towards D1 – direction Žilina. For this section you will need a highway sticker (Highway stickers are available either at the border office or at the first OMV gas station in Slovakia. These stickers are usually controlled when leaving Slovakia.). Leave the highway D1/E75 at the BTS Airport (“Letisko”) exit, then turn right on the first crossroad with lights. After that follow the main road – turning right and then left. Continue straight towards Security Gate Nr.10 (it will be on your left). Here you will need to show your ID in order to continue inside the Airport’s Support Area. 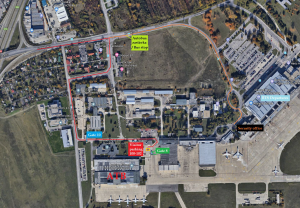 Continue straight and turn right after the second building on your right, towards the Security Gate Nr.8 (blue container). Park your car on the right on parking spots Nr. 100, 101 or 102, and please call the person at ATB whom you are visiting – this person will need to pick you up at this Gate. You also will have to go through the Security Check here. From Bratislava town: Buses Nr.61 (start at the Main Train Station, also the Night Bus version Nr.N61) and Nr.96 (starts at Prokofievova street) stop here at the FAFRUNY bus stop. Once you get off, walk a few meters back and turn left /away from the main road/. Now follow the main road turning right and then left. Then continue straight towards Security Gate Nr.10 (it will be on your left). Here you will need to show your ID in order to continue inside the Airport’s Support Area. After the Gate continue straight and turn right after the second building on your right, towards the Security Gate Nr.8 (blue container). From here please call the person at ATB whom you are visiting – this person will need to pick you up at this Gate. You also will have to go through the Security Check here. From Vienna airport: If you take a bus from Vienna airport, it will take you all the way to the BTS Terminal. From there please call the person at ATB whom you are visiting – this person will have to come pick you up with a car (a 3-min drive). 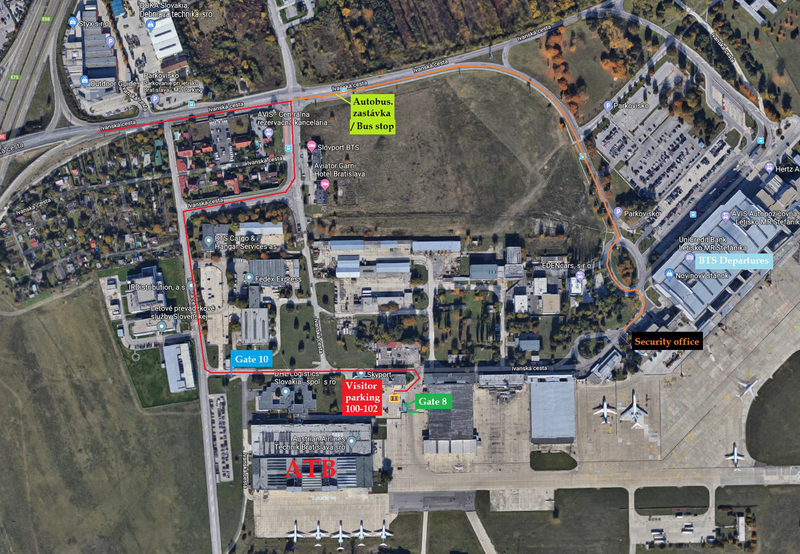 Tell the taxi driver to take you to the Support Zone (Hospodárska zóna) of the BTS Airport, to the Security Gate Nr.10 (Not to the BTS Terminal!). From there on please follow the instructions mentioned above.